In December of 2014 I was contacted by a man who had somehow tracked me down based on one of my old blog posts describing several of my earlier projects, including this replica from a decade ago. 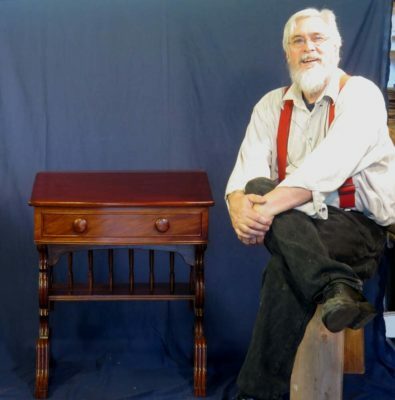 He requested that I undertake a similar commission to build an iteration of an early 19th century writing desk, employing the furniture making technology of that period. After much correspondence I agreed to give it a try, but let him know it would be a great many months before I could begin. At that time I had two book manuscripts to complete (Studley and Roubo on Furniture Making) in addition to the bajillion details inherent in creating the once-in-a-lifetime pinnacle-of-a-career exhibit of the H.O. Studley Tool Cabinet and Workbench. In short, I accepted the project with the caveat that I could not even begin to turn my attention in that direction for at least eight months. Fast forward to now. Two books, one exhibit, a broken hip, and a broken arm later it’s done, and the delivery is on my calendar. Over the next few weeks I will post several blog entries describing the project in probably far more detail than you want, but that’s the way it is. My friend Clint sent me this video (“This is what passes for entertainment among the blacksmith’s group”) and it made me smile. I’ll bet it will have the same effect on you. 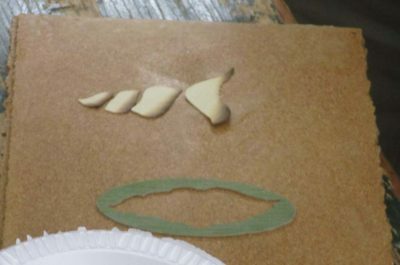 With the simpler morning exercise completed we dove into the slightly more challenging task of replicating a flower petal. Beginning again with a taped-together packet and drilling a tiny hole at an intersection near the center, the sawing began. Starting near the center and working out, a necessary habit due to the packet being secured only at the outer edges, the pieces begin to pile up. 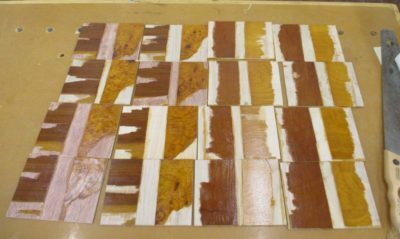 Soon all the elements are sawn and separated, ready for the hot sand bath to impart scorched shading. 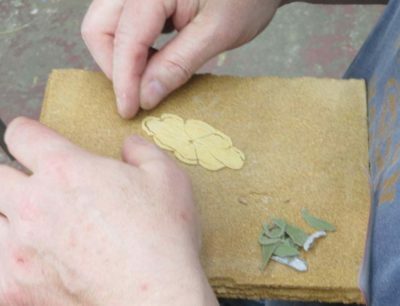 After gluing down the outermost element to some kraft paper, the individual petal are soon in place. And then it is done, ready to be trimmed and incorporated into a Federal style table design. The day after Veneer Repair came a session to create a pair of oval Federal inlays. 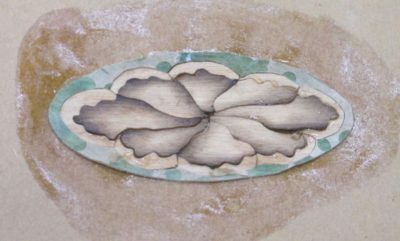 The morning was spent creating a simple conch shell pattern patera about 2 inches by four inches, in an oval surround with multi-stringing border. I provided all of the tools and supplies for the students. 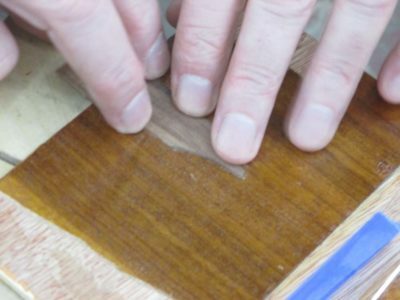 The first process is to make a packet of the veneers from which the patera will be cut. These are just stacked and wrapped with veneer tape. 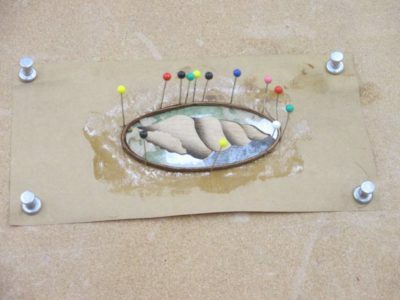 Then the pattern is glued to one face of the packet, using stick glue. 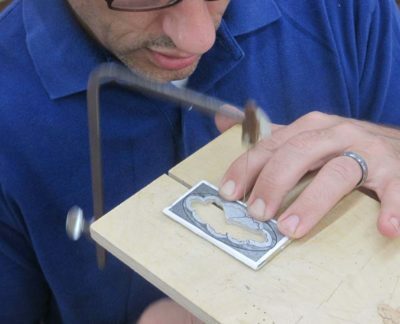 Using a small eggbeater drill and a tiny bit, a hole is punched in an unobtrusive spot and a jeweler’s saw blade (0000 in this case) is fed through, hooked up the the saw frame, and the sawing begins. 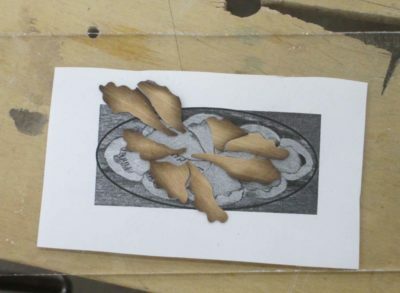 Once the pieces are all cut out they are immersed into a bath of hot sand to scorch in the shading pattern. The end result is a compelling one. 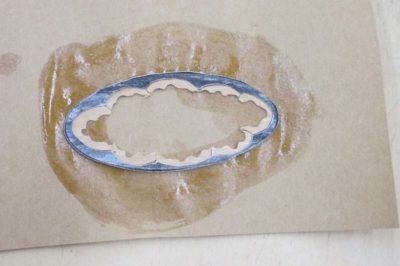 The pieces are all glued to a piece of kraft paper backing, and the stringing border also glued to the same paper with the help of a pile of straight pins. 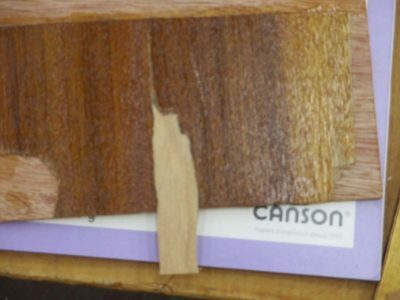 The proud wood would be trimmed with a sharp chisel and then it is ready to use. Thus endeth the morning. Up next, the second patera. 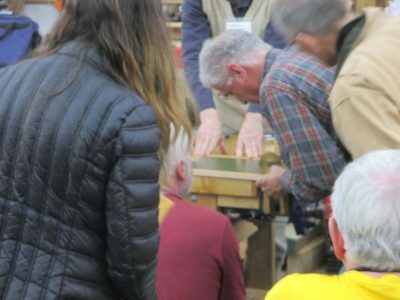 Following the recent Groopshop gathering at the Connecticut Valley School of Woodworking I stuck around to teach a couple of one-day workshops. 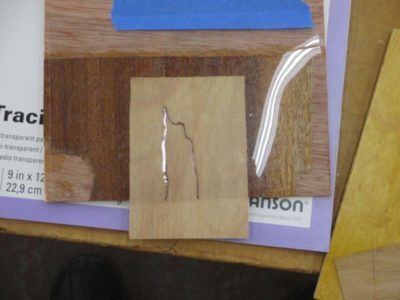 The first was “Veneer Repair” wherein I presented a group of techniques I’ve learned or created over the years. 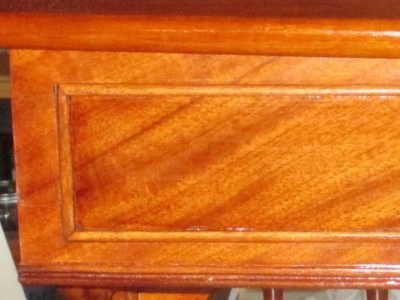 Having looked at an awful lot of historic furniture in my career, I think it is safe to say that the challenge of dealing with veneer damage and loss has been beyond the skill-set of a great many folks in the business. This is a topic of great interest to me, and since I’ve taught it many, many times, including last week, there seems to be interest in it. I am currently scripting out a video to shoot here in the coming winter with a young videographer living nearby. My first order of business, a month before the class, was to make a set of near-identical “problem” boards for the students to work on. These were fairly good representations of the types of problems they will encounter. 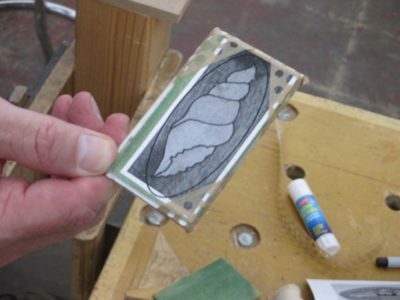 The marked veneer is then mounted on a backing board with stick glue, and cut out with a jeweler’s saw. If all goes well you get a perfect fit from the git go. 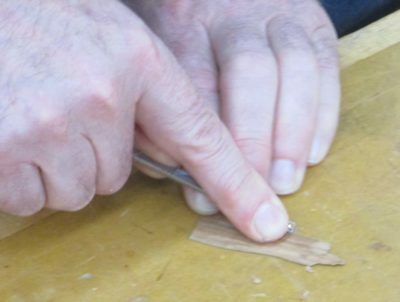 But sometimes the back side of the joint edge needs to be feathered with a small gouge to make it fit perfectly. 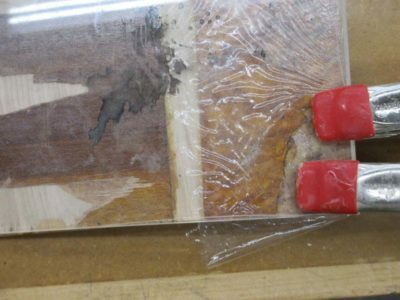 Once you have the grain and fit correct, you slather on some glue, overlay with a piece of cling wrap or mylar, and clamp with a plexi caul and the veneer repair is pretty much done. There is finish work yet to come, but that is another subject for another time. 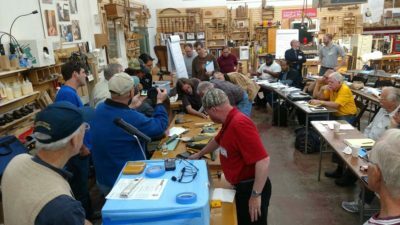 A number of other techniques were taught, but I was so busy teaching that I forgot to take pictures of them. You’ll have to wait for the video, I guess. 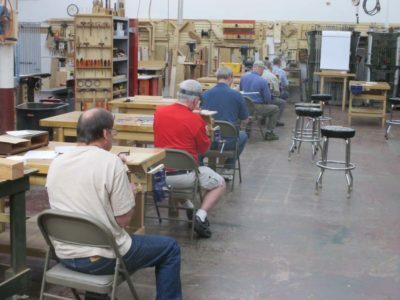 My first sense of not fitting in with woodworking came on November 9, 1980, when I attended a weekend workshop in Atlanta taught by Ian Kirby. I remember it so precisely because it was in a classroom at Georgia Tech, and that was the day that Tech tied the #1 football team (Notre Dame) in the country and the campus went wild. 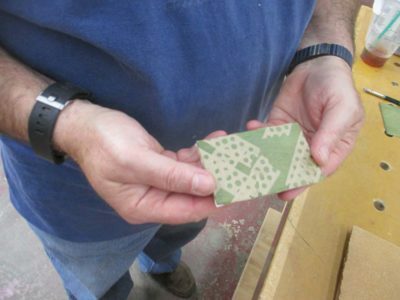 The subject of the workshop was ostensibly mortise-and-tenon joinery, but I seem to recall him spending an inordinate amount of time extolling the virtues of a new power tool, the biscuit joiner. Of course I bought one, and of course it has remained unused for the past 46.99 of the intervening 47 years. I’m soon sending it off to my friend Pete who can put it to good use. 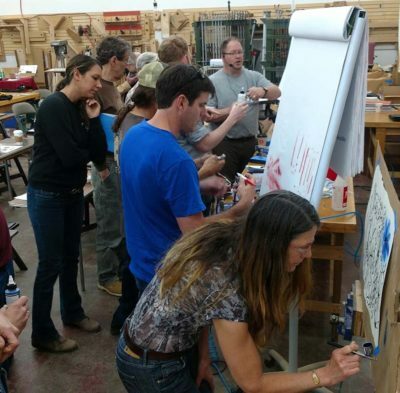 As is often the case at weekend workshops, regardless of the setting or instructor, there is the opening ritual of the attendees introducing themselves to each other. At this particular weekend the attendees were a mixture of doctors, lawyers, accountants and such. When I introduced myself as a finisher by trade and that I loved finishing, I could almost sense the rest of the students recoiling as though I was some alien creature whose spaceship was parked out on the lawn. Despite that, and despite the fact that I was the youngest participant by two or three decades, at every break and every meal I was peppered with questions about the mysterious and un-knowable world of finishing. I’ve heard that surveys of the populace reveal that the single greatest fear is the terror induced by the prospect of public speaking (I have no such trepidation, probably because I do not care if the audience agrees with me or not). 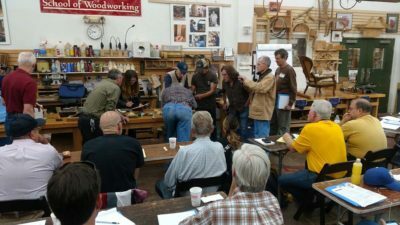 During that student introduction I was left with a distinct impression that has become cemented over the decades that some/many/most/virtually all woodworkers are as terrified of finishing as they are of public speaking. 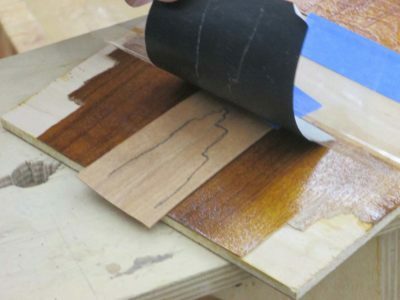 Which brings me to my current project, as this week I am rubbing out and detailing the finish I have been so lovingly applying for the past 40 or so hours of shop time. 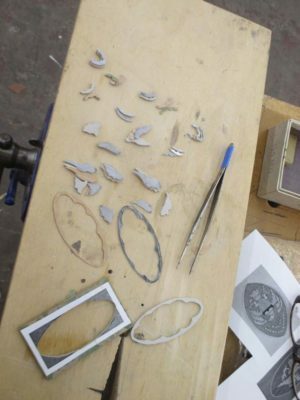 Not only has every moment of the surface prep and application been something to savor, the bringing of the piece to exquisiteness through the finishing process is simply an embarrassment of riches to me. 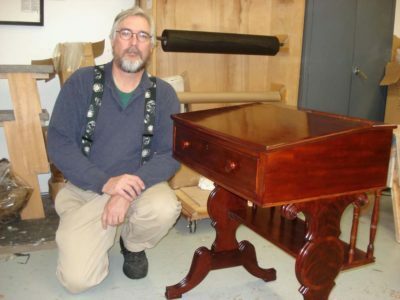 Sure, I found it amusing to make the piece from scratch using almost exclusively early-19th Century technologies as specified by the client, including resawing the lumber, cutting all the lumber and joinery by hand, carving all the moldings, hand sawing and assembling the veneerwork. But to me they were simply the appetizer. Finishing is the feast, and the whole point of the making. Which I guess makes me a polisher luxuriating in my own peculiarity. 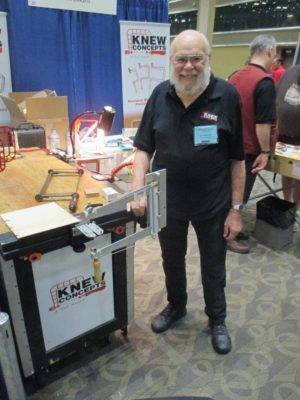 I was saddened to learn last week from Brian Meek that Lee “The Saw Guy” Marshall had passed away. 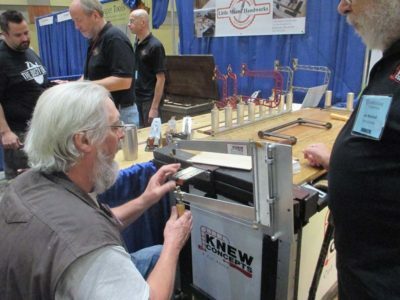 Lee was the creator of the Knew Concepts company that produced the finest jeweler’s saws and coping saws known to man. 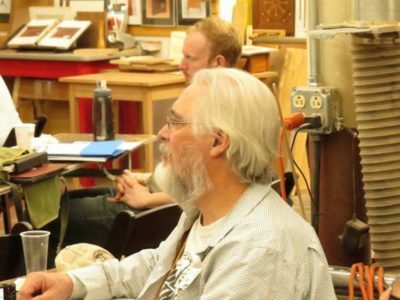 My friendship with Lee (and Brian) had grown continually since we first met many years ago at a Woodworking in America event, and ever since we had picked each other’s brain on many occasions. In some respects our friendship must have been an odd one, and more than once Lee remarked, usually with a chuckle, that he was surprised that a “Santa Cruz lefty” got along so well with someone who thinks that 1964-era Barry Goldwater was a moderate. Our relationship grew into me being an enthusiastic collaborator with Lee and Brian as they continued to invent and refine new versions of their products. Our correspondence was frequent and I reviewed countless design drawings that Brian sent me for comment, and I have many Knew Concept prototypes in my shop, and will continue using them until I hang it up. 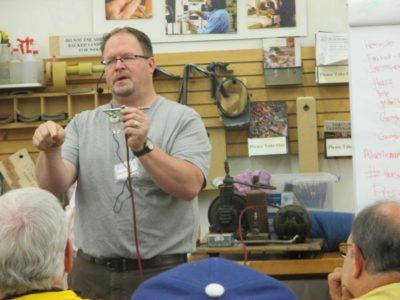 Lee was always curious about augmenting his own experience with that of others, and for several years we combined Lee’s aerospace machinist mindset with Brian’s background as a bench jeweler with mine as a woodbutcher. 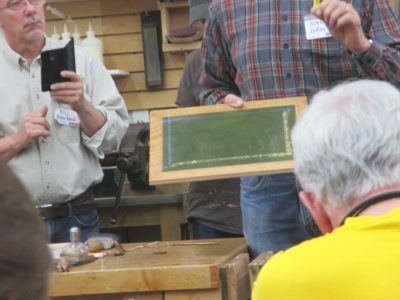 Many was the time I would explain precisely how it is that woodworkers used their tools, and before long I would see some new understanding become manifest in their tools. In many respects Lee was a model for me to follow. 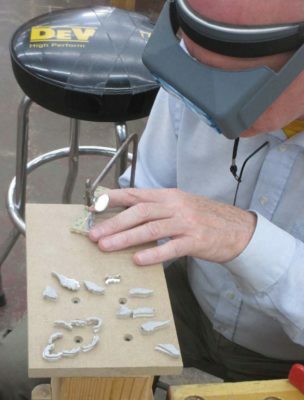 An octogenarian whose good cheer, unfailing generosity and insights were never diminished by some serious injuries he had suffered many years ago, rendering him officially “disabled,” Lee was simply one of the most inventive and hard working men I have ever met. 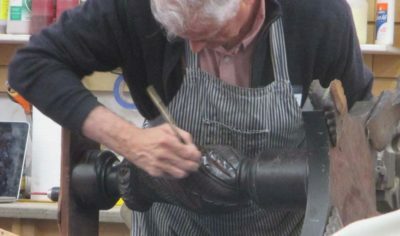 His brain never turned off, working diligently until the end, creating and inventing with many projects in development at the time of his death. Brian assures me that they will be carried to completion. To his wife and family, and all who knew and loved Lee I extend my sincere condolences and offer heartfelt blessings in the sorrow of his absence from us. He is greatly missed. The events that are Groopshop are filled with levity and camaraderie, perhaps unlike any I have been party to (admittedly I might not be the best judge of this as I was the guy at high school pool parties who was sitting in the corner reading the encyclopedia). 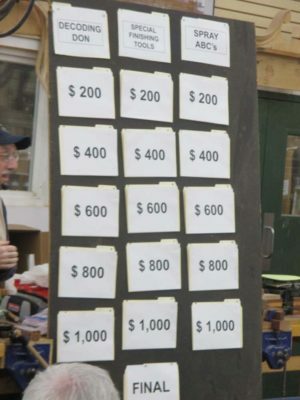 On the second night of Groophop we usually have a delightful evening of fun in the guise of “Refinishing Jeopardy” followed by “Mike’s Mostly Honest Auction,” when we raise money for the operation of the organization through selling and buying each others’ shop surplus supplies. Apparently they think I am in love with arcane words and esoteric technical terms, and this was the chance for the contestants to try and figure some of that out. I may have been a little strict with Freddy Roman during the judging, but I sent him a box of shellac flour as an apology. 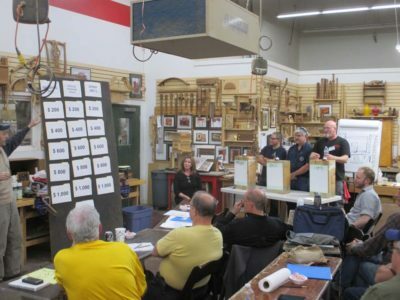 Following “Refinisher’s Jeopardy” the auction commenced, and the bidding was spirited and the lots were enticing. I bought some sheets of veneer, loose abrasive powders, and some more stuff I cannot recall at the moment. 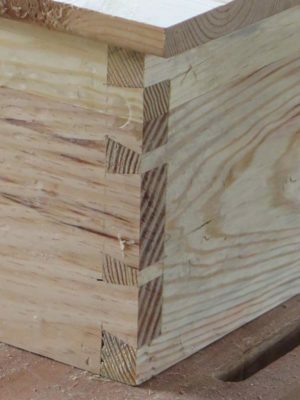 One of the most vigorous episodes was for some lumber AlL brought. 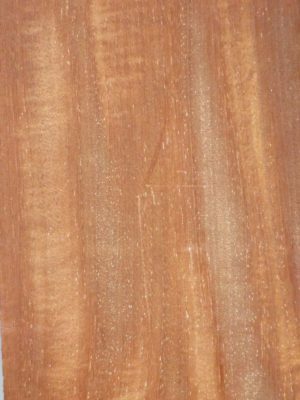 I bought a lovely pair of matched Spanish Cedar boards, but was outbid for a spectacular piece of Swietenia mahoganii by JohnC. It was a real beauty. 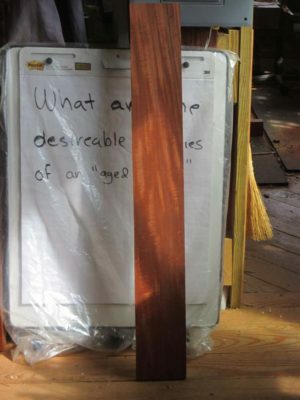 But the real heartwarming surprise came the next day as I was in CVSW setting up for my workshops the following day, and found the John had left me the board as a gift. I was truly moved by the gesture, and since no good deed goes unpunished I am considering appropriate packages to send him in return. 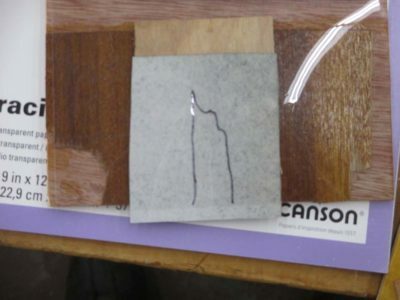 The board was perfect for turning into sawn veneer for an upcoming project. That’s the kind of group Groop is. You should join us, but only if you want to learn, exchange information in a friendly environment, and have fun. 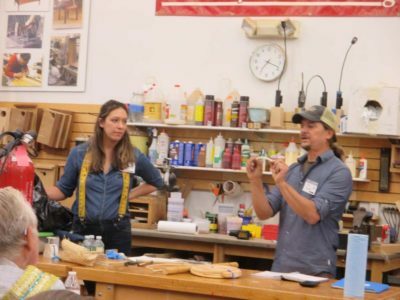 The program for this year’s Groopshop of the Professional Refinisher’s Group was an embarrassment of riches, with wide ranging presentations and demonstrations that were edifying to all in attendance. 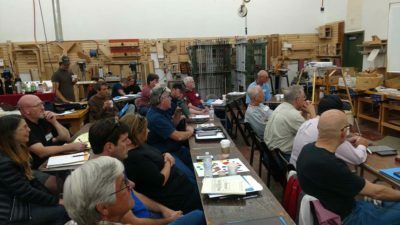 As was the usual for our events, the several dozen folks in attendance were held in rapt attention as every single session provided nuggets of knowledge for us present. 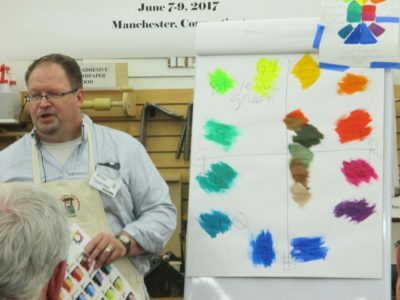 Golden Artists Colors technical guru Mike Townsend gave a reprise to his presentations at the very first Groopshop almost two decades ago with two spectacular demos on color theory and airbrush techniques. 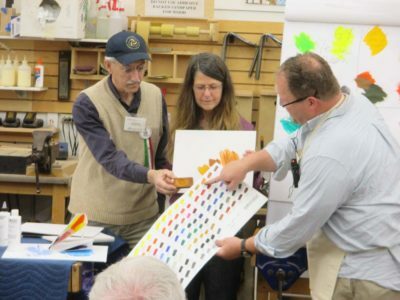 I am a bit of a color theory maven myself and found Mike’s presentation of the idea and practice of color decoding and matching to be superb. He has a real sense of how to connect to an audience of varying experience, and his own background as an artist really comes to light when he is discussing appearance. He provided blank panels to everyone and we followed right along as he showed how color interact with each other. His no-nonsense demo of airbrushing was a huge hit, and as is often the case with Groopshop demos the audience was soon crowded around him trying all the things he was showing us. 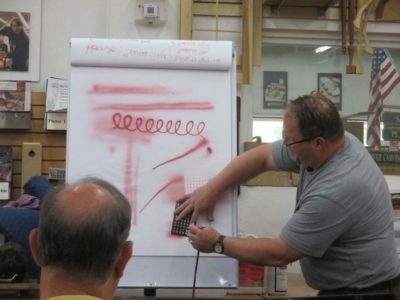 One of the highlights of the session was his use of an almost century-old mini air compressor to drive his airbrushes. 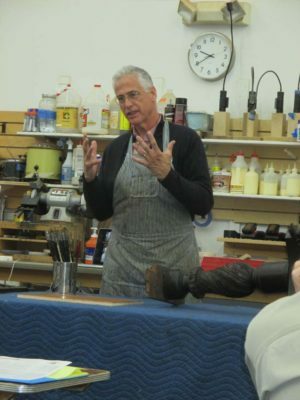 John Coffey also had two sessions, sharing the lessons of several decades’ worth of successful experience. 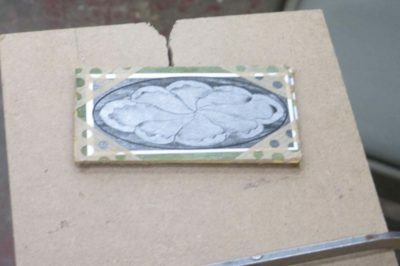 His first session was an excellent discourse on dealing with curvalinear and heavily carved surfaces, and his second was a demo of gilded borders on leather tops. To say the least the interest was high for both of them, and he found himself in the center of a mosh pit. 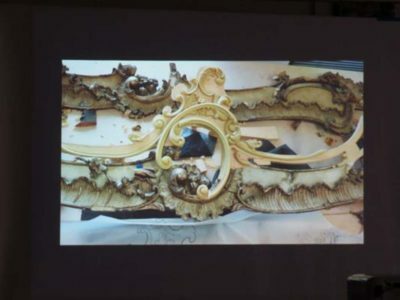 Len Reinhardt was attending his first Groopshop and absolutely stunned us with a recently completed project of conserving a pair of giant valances from a famed historic mansion in Nashville. It really was a first-class project and presentation. 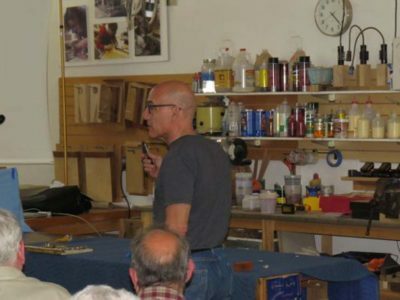 Dan Carlson regaled us with the mostly-unsuccessful fad of repainting countertops in situ, along with many other home remedies for damaged furniture. Given that many in our cohort will be called on to deal with these failures it was timely instruction. 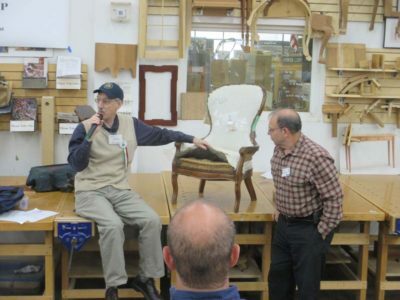 Mike Mascelli and Tom DelVecchio somehow snuck in some discussion of caring for and preserving aged upholstery. 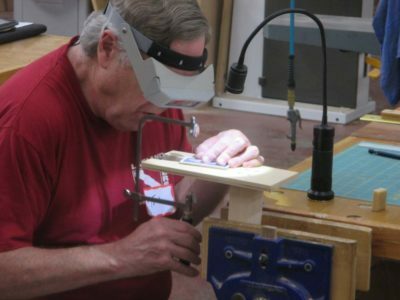 Tom is the inventor of The DelVe Square that is made by Woodpeckers, and one of my very favorite tools. John Szalay and Christine Grove were given an open mike for the after-dinner session on the first day, and as usual had our jaws hanging open with the inventive amazingness of their projects, ranging from furniture restoration to restoring vintage soda machines to casting metal parts for vintage motorcycles to rebuilding vintage woodworking machines. Jon is better known to the outside world as “Jersey Jon” from the American Pickers” television show. Christine has a passion for old-time machines, and of course high fashion. 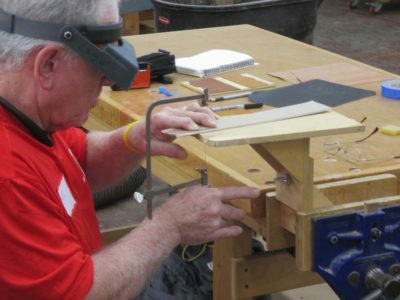 Al Lopez recounted the progression of his shop from small furniture restoration outfit to a large project, mostly architectural restoration enterprise. I was so busy listening to his talk that I forgot to take pictures. Sorry Al. 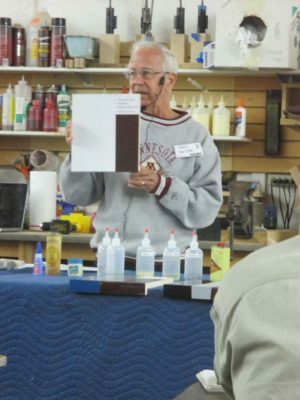 Other presenters who I also failed to photograph were Mark Faulkner and Val Lennon from Besway/Benco, briefing us on new regulations about solvents and chemical safety and disposal. (I took advantage of their proximity to pick their brains about my upcoming dive into the production of Mel’s Wax.) Freddy Roman evangelized us by cataloging the role of social media in his business plan. His talk was simultaneously awesome and terrifying to a sixty-something minarchist like me. 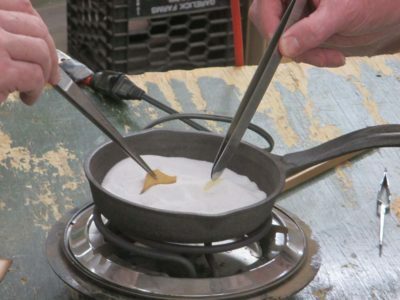 I gave two shorter talks, one on our recent adventures in ripple moldings, and one on the technology of emulsions and the design of Mel’s Wax. I distributed free samples of the latter with the extracted promise that everyone who took a sample was required to give me constructive feedback, which has begun to flow in. Even with all of this I m sure I forgot to mention some of the learning opportunities there, and for that I apologize. And the fun was not over yet. 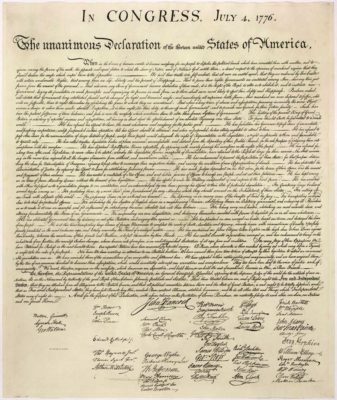 As we consider the world around us it is worth reflecting seriously on the document encapsulating the ideas that founded the greatest nation ever known to man (the US Constitution WAS NOT a founding document for the nation, it merely established the rules for its governance [admittedly now generally unknown and ignored] which is not the same thing). I pray you will read and reflect on the ideas expressed by men who pledged their lives, their fortunes, and their sacred honor to pursue the path of liberty. Reading it is like reading the Minor Prophets of the Old Testament; more up-to-date regarding the human condition than tomorrow’s headlines.